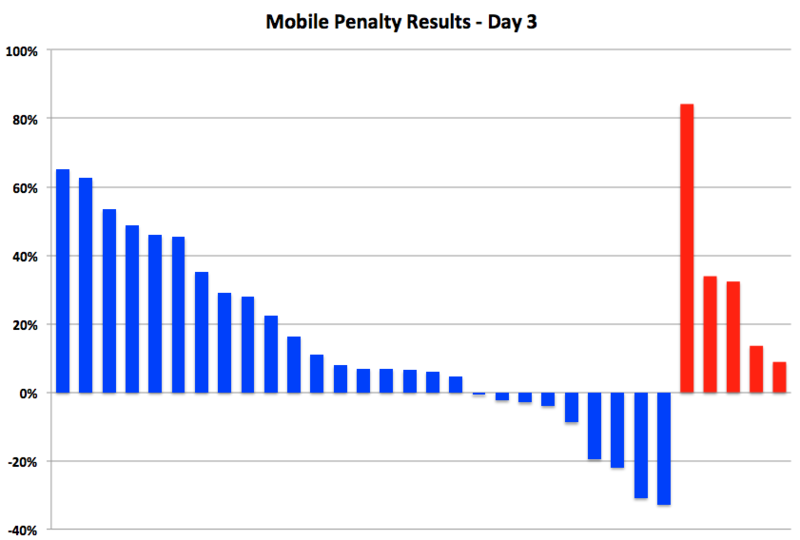 Google Mobile Penalty Study Day 3: In Which we ask, "What Rollout?" Across the board, SEOs are asking “what rollout?” Its gotten so odd the Google’s clarified, that yes, there has been a roll-out and in fact it is complete in some data centers… which now begs the question: was this overhyped? SEO Clarity’s study on over 50,000 queries shows a 5% change yesterday – so far this looks like a snoozer. Looking at our much more limited dataset of 59 law firm websites: all 12 of the non mobile optimized sites have seen mobile search traffic above the 8 week benchmark. Aggregating data across those sites shows mobile search traffic 21% higher. That’s right – traffic has increased for every one of these non-compliers post algo update. This is starting to look like the mobile penalty was conjured up by Mountain View to feed business to starving web developers. The graph below shows the sites from our study that had a minimum volume of traffic – blue are mobile optimized, red are not. Things that make you go hmmmmm.